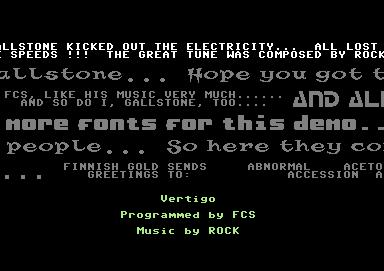 I was thinking about alternative ways to display text (to what's generally in use right now) and then remembered the multiscroller thing in this demo (see screenshot). Definite thumbs up for this great classic with fantastic music! Differing ways to display text is a fine thing to explore. And whacking it all into the side borders was amazing back when this demo was first released... and still fairly difficult for some coders now! page created in 0.015591 seconds with 15 queries.